I’ve been on a cleaning mission around the house. Or more accurately a cleaning out mission. If I haven’t used it in a while, out it goes to be donated because clearly I don’t need it. It’s amazing all the stuff you buy thinking you have to have it, but then realize later that it just sits unused. The mission carried over into the pantry and fridge this week, and I was desperate to get rid of a bunch of odds and ends that were lying around. Heat a large pot over medium heat and add the beef, onion, and celery. Cook while breaking up the chunks of meat until there are no pink parts left, and the onion and celery are softened. Add the remaining ingredients, mix well, and bring to a boil. Reduce heat slightly, cover, and simmer for about 15 – 20 minutes until the carrots soften. Remove from heat and divide evenly into bowls. Makes 4 servings at approximately 251 calories – 24g protein, 14g carbs, and 11g fat. Seriously, it’s that easy and fast to have stew. Plus it really is that low calorie. You can add mushrooms, spinach, or any other stray veggies that you find in your fridge too if you don’t have carrots and celery. Judging from how clean the bowl was licked, it got a thumbs up from The Kid. 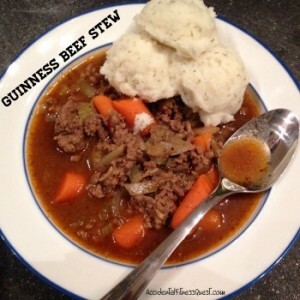 Any self-respecting Guinness stew wouldn’t be complete without fancy mashed potatoes to mix in. I used plain old boxed flakes, mixed them with almond milk, whipped dairy free butter, roasted garlic cloves, and fresh dill. The extra step of adding roasted garlic and fresh dill really takes the flakes up a notch and makes them taste so much better for almost zero extra effort. I just dropped a few scoops onto the stew to mix in with each bite. Highly recommended! Don’t settle for plain and ordinary for dinner, or God forbid think you don’t have time and order take out! Get creative with your random ingredients and whip up things like stew in 20 minutes. I even had two servings left for lunch the next day.